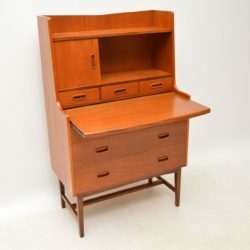 A stylish and practical vintage Danish bureau in teak, this dates from the 1960’s. It’s a great size, with a pull out writing slide and lots of storage compartments. 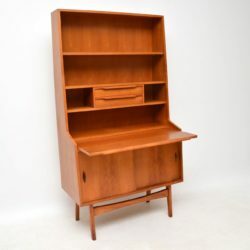 There are drawers in the bottom and middle, a sliding door cabinet in the upper section and an open bookshelf on the top. We have had this stripped and re-polished to a very high standard, the condition is superb throughout. 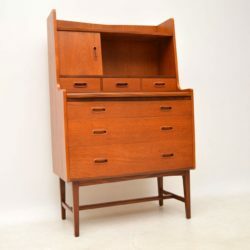 A smart and useful vintage teak bureau, this dates from the 1960’s. It’s compact a nicely designed, with lots of storage space and an ample work space. The condition is good for its age, there is some minor surface wear here and there, and there’s been a small repair around the lock of the writing compartment. 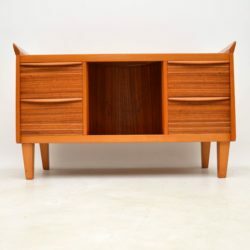 This has a lovely colour and striking grain patterns. 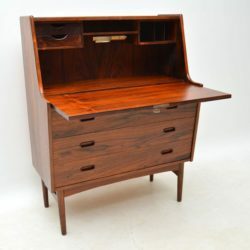 A beautiful and very unusual vintage walnut dressing table with two matching chests, these date from the 1970’s. The dressing table has a lift up top that reveals a mirrored interior, it sits on thick chrome cantilevered legs. 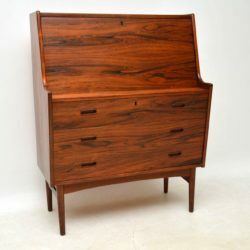 The two smaller chests tuck underneath, they are designed to be used either as stools to sit at the dressing table, or they could be used as a bedside chests. Each one has three drawers and they roll smoothly on casters. 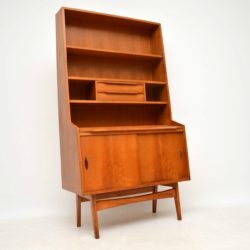 The condition is great throughout, all is nicely polished, with no damage to be seen on the wood, the walnut has a lovely colour and beautiful grain patterns. 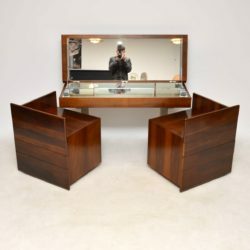 The mirrored interior or the dressing table is mostly in superb condition, there is just one tiny crack to the mirrored glass on the inside side panel, which is hardly noticeable at all. 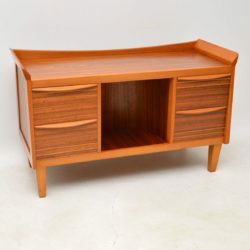 A beautifully designed vintage sideboard in walnut, this dates from around the 1950-60’s. 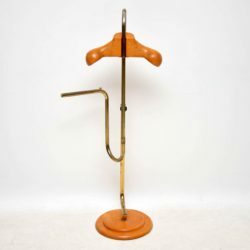 It has lovely small proportions so would fit in most spaces, we have had this fully stripped and re-polished, the condition is superb for its age. This has an unusual concave recess in the middle for storage, perfect for holding drinks bottles. 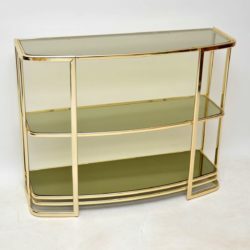 A beautiful and very well made vintage brass wall unit, this was made in Italy and it dates from around the 1970’s. It’s in great condition for its age, with only some extremely minor wear here and there. 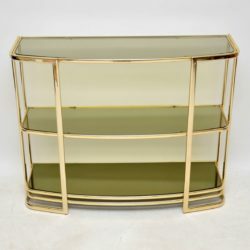 It has two smoked glass upper shelves, and the lower shelf is mirrored glass. 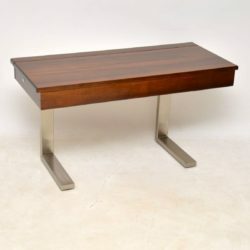 This is a useful and versatile piece, it could be used as a console table, bookcase or display cabinet. 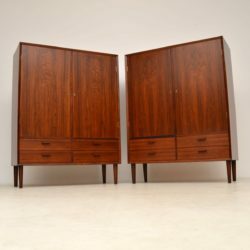 A stunning and rare pair of vintage Danish rosewood cabinets, these were designed by Borge Mogensen, and they were made by Brouer in the 1960’s. We have had these stripped and re-polished to a very high standard, including the insides; the condition is superb throughout. The colour and rosewood grain patterns are amazing, even on the inside, and these have adjustable glass shelves. 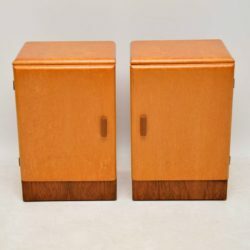 A stylish and well made pair of Art Deco bedside cabinets predominantly in Birds Eye maple, with walnut bases and handles, these date from around the 1930-50’s. 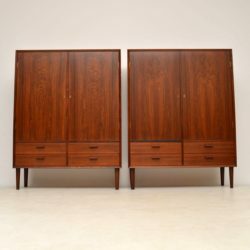 These are a great size, have a beautiful colour and lovely grain patterns. We have had these fully stripped and re-polished to a very high standard, the condition is superb throughout. 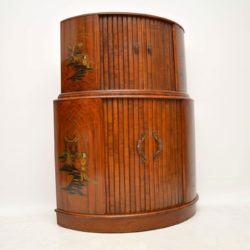 A beautiful and quite unusual vintage walnut cocktail cabinet from the Art Deco period, this dates from around the 1930-50’s. 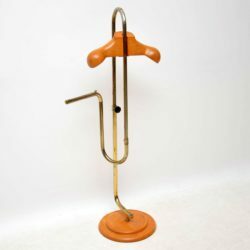 It has a lovely demi lune shape, with tambour doors at the top and bottom, and ample storage space for glasses and bottles. 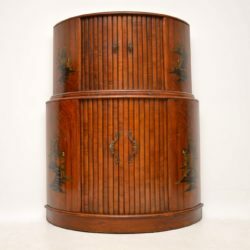 The walnut has a nice colour and striking grain patterns, this also has unusual and very beautiful chinoiserie paintings on the four panelled corner, each one different to the next. 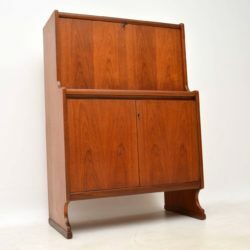 The overall condition of this cabinet is very good for its age, there are a few minor marks and some minor wear to the polish here and there, seen in the images. 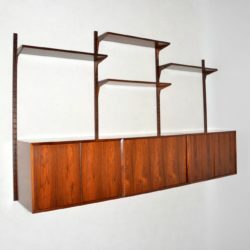 A superb vintage Danish wall unit in rosewood, this is the Royal shelving system designed by Poul Cadovius, this was made by Cado in the 1960’s. 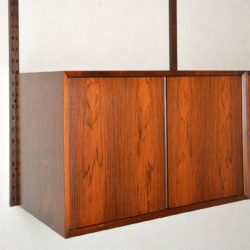 The quality is amazing, the vertical rails must be screwed to a wall, then the cabinets and shelves can be hung and altered very easily, they simply lift on and off angled dowels. 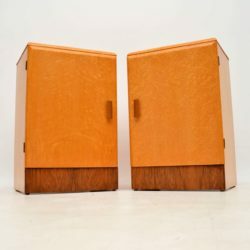 We have had all the cabinets, shelves and chevron supports stripped and re-polished to a very high standard, the condition is superb throughout; the grain patterns and colour is stunning all over, including on the inside. Two of the four rails are about an inch or two shorter than the other two. 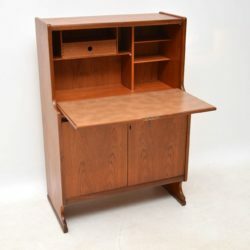 We also have another single bay unit available separately that came with this, that contains a desk, shelf and cabinet, and is seen listed under our other items for sale.